The foundation of your facility is potentially the toughest part of a commercial property to inspect. Given that foundation keeps properties above the ground and intact, it’s crucial for your property to have a solid foundation. Without proper foundation maintenance, the foundation of your building could potentially crack or even sink. Let’s take a look at how a foundation inspection works and why foundation maintenance may prevent your commercial property from shifting. You may be wondering, what does a commercial foundation inspection entail? Well, oddly enough, the first part of the inspection does not actually involve the foundation. Instead, it involves examining areas of the property. For example, the foundation contractor will check the floors in the building for inconsistencies or slopes. The contractor will also check for signs in the walls such as cracks or odd gaps in door or window frames. Likewise, they will check to see if they open and close incorrectly. If the building looks in any way uneven, it may indicate the need for a commercial foundation repair. 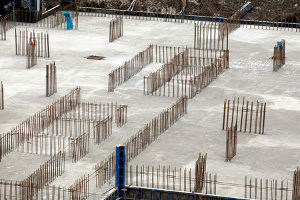 The next part of the commercial foundation inspection involves checking the foundation itself. Obvious indicators of the need for maintenance are cracks or sinks in the foundation. One of the less noticeable signs includes the foundation not being straight in line with the building. This is a result of a shift due to the movement of the earth. The biggest warning sign that points to the need for a foundation repair is if water or moisture is found on the foundation. If the water ends up leaking through the foundation, it must be repaired. Lastly, mold on the walls, especially in an area of the building that is underground, is a principal indicator of the need for a commercial foundation repair. 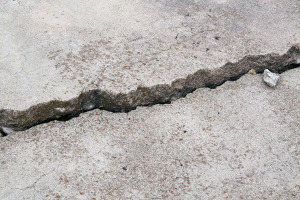 Repairing the cracks in the foundation is generally the easiest foundation repair to deal with. Reinforced concrete can be easily poured into the cracks of the foundation. After that is fixed, the underlying issue must be determined. If the foundation cracked due to water leaks, the pipe that the water leaked from is identified and will be fixed. If a giant tree sits right near where the foundation cracked, it is cut down and removed from the ground. Believe it or not, roots of trees can actually end up shifting the foundation of your building, causing it to crack. The toughest part of foundation repair is fixing a sink or shift in the foundation. When the commercial building’s foundation forms a slope, a push pier system is required to fix it in some cases. This uses a heavy load of force to drive the support beam of the facility upward. As a result, that area of the building can become level again. At the same time, the levels of soil in the complex must not drop either, so a lot of fill dirt and soil is required after the push pier process is finished. Shifting in the slope generally attributes to doors and windows not closing properly, and thus the openings must be fixed to fit the doors and windows perfectly as well. It may seem easy to identify what is wrong with your commercial property. However, there are plenty of areas, such as the building’s basement, that must be properly evaluated. A professional foundation contractor will thoroughly examine all areas of your commercial or industrial building to diagnose the issue with your foundation. For a free quote regarding a commercial foundation inspection, or for any other property manager services, contact Dirt Connections today.